Updated Tuesday June 19, 2018 by Whitby Minor Baseball Association. 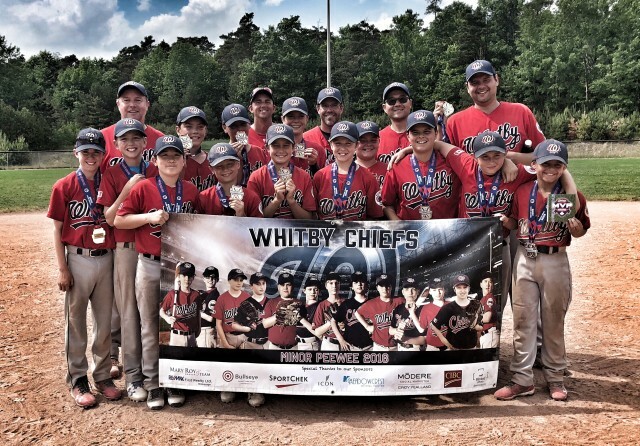 The Minor Peewee T2 Chiefs continued their tournament season with a championship in Barrie over the Father's Day weekend. The Chiefs faced the Kanata Cubs in game 1 on Friday evening. Kanata struck early, putting up 3 in the top of the first. That was all they would get. The Chiefs scored 2 in the bottom half then exploded for 7 in the second to take the game 9-3. Saturday morning saw the Chiefs facing Bradford. Scoring in bunches once again, the Chiefs posted 7 in the second and 5 in the sixth. Excellent starting pitching from Tom Paddick and an efficient mop-up effort from Brennan Kloostra held Bradford to 4 runs and ensured the victory. Game 3 on a hot Saturday afternoon saw the Chiefs against Waterdown. The Chiefs pounded out 13 hits and scored in all but two innings while a solid start from Owen Briggs, allowing 2 hits and striking out 5 over 4 innings followed by hitless relief from Trey O'Donnell held Waterdown to a single run and the Chiefs were 10-1 winners to maintain their perfect record. This set up a showdown to determine first seed for the semifinals with host Barrie who were also undefeated on the weekend. In the Chiefs third game of the day Saturday evening, the long day had taken its toll, and the Chiefs started off flat, surrendering 7 runs in the top of the first to a fresher Barrie team. The Chiefs battled hard to get back in the game but ultimately ran out of time and fell 12-7. Having finished second in the preliminary round, the Chiefs were scheduled for a rematch with Kanata Sunday morning. With the score tied 2-2 after 2, the Cubs scored again in the third and were threatening to add more, when catcher Ryan McGivney caught consecutive runners stealing to end the inning. The teams began the 7th inning knotted at 4, and after two quick outs, Kanata struck with three hard hit balls and scored 2 runs to take a 6-4 lead heading into the bottom of the 7th. A couple of hits scored a run for the Chiefs, but they were still down by 1 with 2 out. A first pitch single by Dylan Takahashi scored a runner from second, and the game was tied with the winning run on first base. Jakhai Reid-Innis hammered the first pitch he saw into the gap in right field and pure hustle from Takahashi beat the relay home and the chiefs had won their second walk-off victory in as many tournaments! The final game pitted Chiefs against the Stouffville Yankees, who had also won dramatically, making the final out with the tying run on third base. As the home team, the Chiefs' game started a little shakily and they found themselves with bases loaded and none out in the top of the first. The cleanup hitter bounced a comebacker to starter Matthew Gaspar who started a perfectly executed 1-2-3 double play. It was the Chiefs' seventh double play of the weekend. The next batter grounded out and the Yankees were held scoreless in the first. The Chiefs posted 3 runs in the second and third innings, and one in each of the next three to cruise to a 9-2 victory and secure their second tournament championship in as many tries. Jakhai Reid-Innis was named tournament MVP for his consistently high level of effort and performance from the first pitch to the very last. Once again, the coaching staff continues to be impressed by the growth of the team both as a group and individually, and not only as ball players but as young gentlemen in competitive and often stressful situations. We can't wait to see what the next challenge brings out of them.